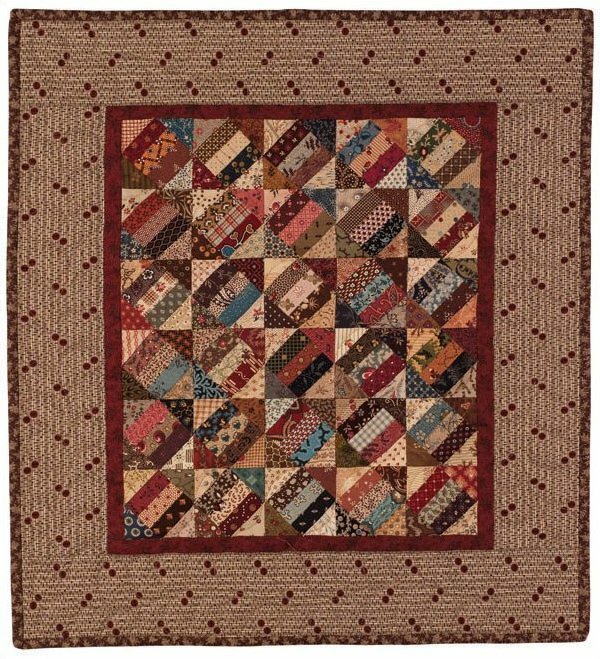 ©2011 17" x 19" "Crackers," the historical name of this quilt block, seems appropriate for the title of this quilt, given the role that crackers played in feeding soldiers during the Civil War. These 3/8" thick biscuits, sometimes called hardtack, were baked in large northern factories, packed in wooden crates, and shipped to troop locations, a process that could take months. By the time they reached the soldiers, they were hard and bug infested, leading the soldiers to refer to them as "tooth dullers," "worm castles," or "sheet iron crackers." Others described them as "indestructible, imperishable, too small for shoeing mules and too big to use as bullets." (See www.nps.gov/archive/gett/gettkidz/hardtack & http://historiccamdencounty.com/ccnews112.) 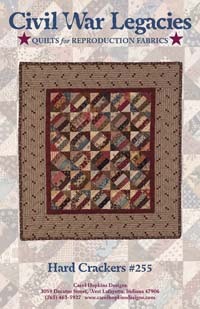 Making the 2 1/8" blocks for this quilt is a great way to use up those small scraps you hate to throw away!